Another new project from the gruesome imagination of Miss Cakehead: Famous for her grisly cakes, she has created a florist selling flowers as dark as Thak Kraken's ink, in collaboration with Kraken Rum, to open for one day only, Valentine's Day 2014, which conveniently falls on a Friday. "Macabre bouquets are arranged in GRAVE VASES and come with a bottle of THE KRAKEN RUM in place of the traditional champagne option. There is even a choice of 2 messages, ‘TAKE ME WHOLE' or 'SWALLOW ME PIECE BY PIECE’, with lyrics taken from The Kraken Rum Sea Shanty recorded by Ross Millard of The Futureheads. The pop-up florist forms part of The Kraken Rum’s KRAKEN VERSUS CUPID campaign, by macabre and infamous Miss Cakehead. Found in Kingley Court, just off Carnaby Street, London, the Think Ink florist is open for one day only - the 14th February 2014 - offering a range of black floral options in return for a voluntary donation to the Project Redsand charity. The black roses for sale are created by placing dark red roses in vases filled with a Kraken’s ink in place of water. This ink is then transported up the stem, via the xylem, to the leaves and petals turning them black, a scientific process that will also be showcased in the space. For dramatic effect some of the flowers will also be turned black using special floristry dyes. There are no naturally black flowers - a truly black flower is as mysterious and alluring as a Kraken – with the endangered very dark crimson Turkish Halfeti roses the closest nature can offer. However the bouquets will also feature Calendula Lily Eclips and Queen of the Night Tulips, both darkest purple in colour looking visually black to the human eye. Kept fresh in pools of black ink, the flowers all come with a miniature bottle of 5cl Kraken Rum, available in the UK from Summer 2014. Currently Kraken Rum is only available in 70cl bottles. 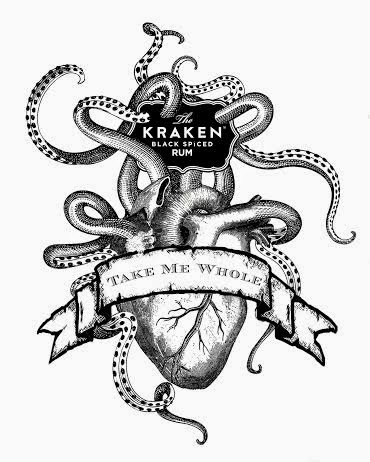 What’s more the London based The Diner group will be serving a one off Kraken Vs Cupid Valentine’s drink in all of their 7 venues, a perfect location in which to celebrate an alternative Valentine’s Day. The activity also continues at ‘The Mesmerist’ in Brighton which will be turned into an inky den for the Kraken Vs. Cupid Valentine’s party. The Think Ink Florist will be open from 0800 until all the bouquets are sold, they are offered on a first come first served basis with one bouquet per customer. Due to the accompanying rum only those aged 18 or over may purchase a bouquet."